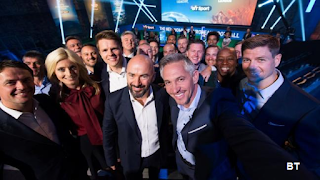 BT is giving away its new European football channel BT Sport Europe to viewers with BT Broadband and BT TV. New and existing BT Broadband customers without BT TV can get the BT Sport Pack for £5 a month and watch via their satellite service or via the BT Sport App. Viewers will need to pay £4 a month for access to the HD versions of the BT Sport channels. A selection of Champions League matches will be offered for free on Freeview via BT Sport Showcase. *BT Sports Europe appeared this morning on Sky channels 457/458 (HD), but was reshuffled during the day. The above reference was changed to reflect this. Sky viewers without BT Broadband. UPDATE: £19.99 a month - one box, add £5 for second box. *Not applicable because you have to be a BT Broadband subscriber to get BT TV. ** price also applies to BT Broadband users who want to watch via the App. Full pricing details for other TV platforms that carry BT Sport to be confirmed. Further information is available via the BT Sport website.